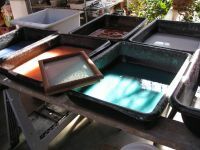 Individual and group private teaching sessions in various aspects of papermaking and book arts can be scheduled at your convenience. A class can be specifically designed for the needs of the individual or group. The fee includes instruction, basic pulp preparation, drying of work, and 1/2 hour for cleanup. Additional fees may include materials beyond the basics and/or shipping fees for completed work.